The move poses a problem for lenders like Bank Austria, Erste Group and Raiffeisen Bank. 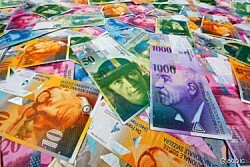 Following the decision of the Swiss central bank, lender stocks were under pressure. Erste Group dropped 2.4 percent to EUR 19.4. The bank was losing up to 7 percent during the day. This article includes a total of 72 words.